Belden electric communications cord assembly. Dual terminal lug ends. 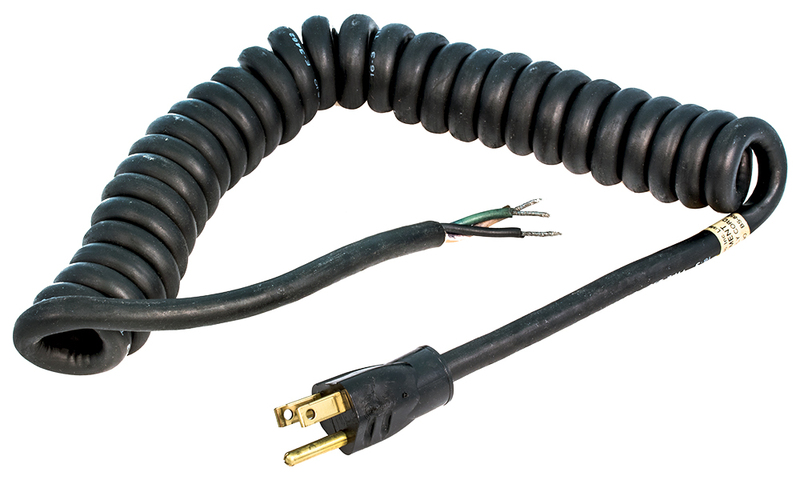 Round coil stretches to 4.5 feet. 2 foot end-to-end unstretched. 3 single strand conductors. 23 AWG. Copper core. Circa 1977. New in package. Belden P/N: 8495. NSN: 5995-00-899-9180. 12 foot power cord. 10 amp, 125v, 1,250 watt. Right angle plug. 5-15P-C13, SJT 18/3. Belden piggy back 18-3 cord. Unterminated. 6 foot long. 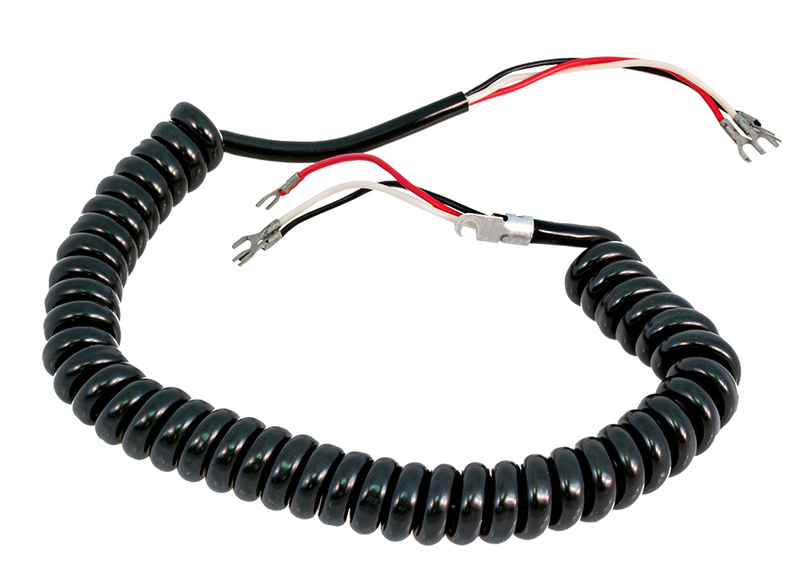 Belden retractable coil cord. 6 foot. 16-3. SJO Neoprene. 2 foot long (end to end) retracted length. 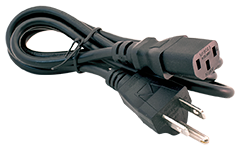 6'L standard NEMA power cord. 10 amp, 18 gauge. 1-15P to C13. Mennekes 6m server cord. 30 amp. 3 wire neoprene cable. 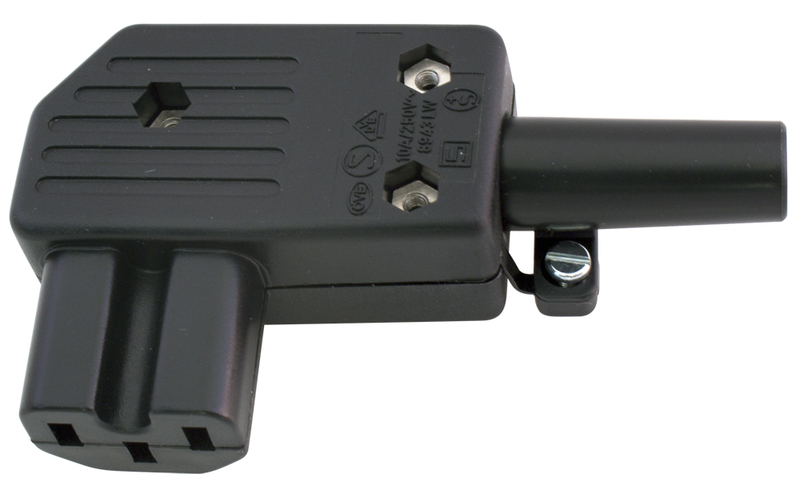 NEMA L6-30 to 3 pin male. 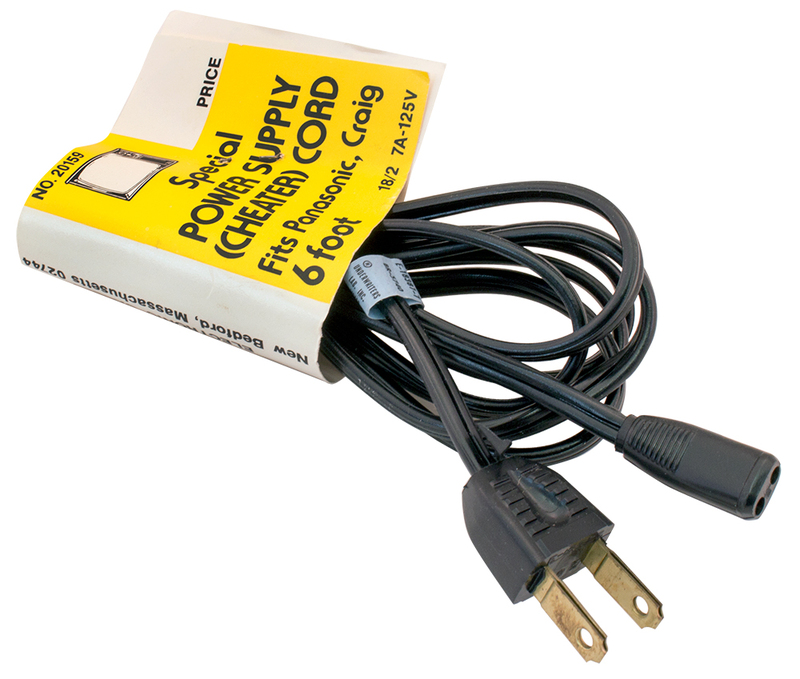 PCE32A6H receptacle (IEC309). 3 blade 6 foot 6" extension cord. 16 AWG, PH386. 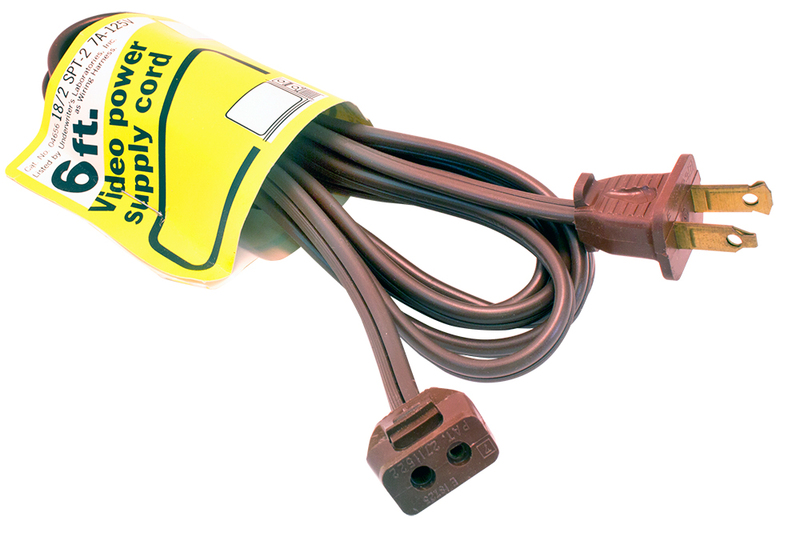 Standard NEMA universal power cord. 8'L. 15 amp. 14ga. 1-15P to IEC320-C13. Right angle inline female plug. IEC PH386. 15 amp, 250v. With strain relief with boot, screw terminals. Alt P/N: 8784. Mates with receptacle (CNE) 42R36-3154-150. 3 blade horizontal female AC plug. IEC C19. 21 amp, 125/250 vAC. With strain relief, screw terminals. Cisco 14'L cord. 12ga. C19 to NEMA 5-10p. New! Cisco 15'L cord. 12ga. 20 amp. C19 to L6-20P. 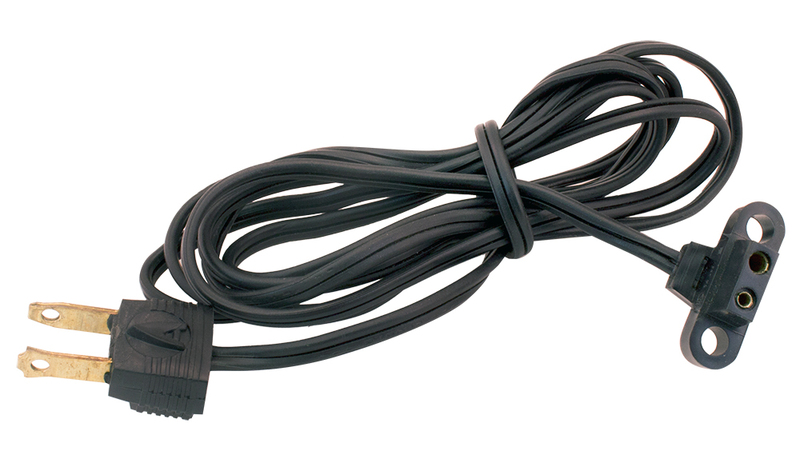 Cisco 6'L keyed power cord. 16ga. C15 to NEMA 5-15. 6.5' HP power extension cord. 14ga. C19 to C20. High quality. Brand new! 6'L extension cable. C13 to C-14. 17ga. 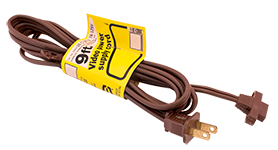 Extend your standard machine cord by 6'. 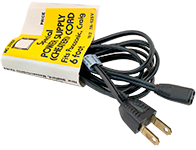 10'L standard NEMA power cord. 10 amp. 18ga. 1-15P to C13. 7'6" long, 14 gauge, 3 conductor. 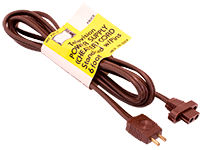 A superior UL/ CSA rated SJT cord with foil shielded / drain. Have you ever tried to plug in a PC, printer or monitor only to find out the plug in your hand is oriented 180º from the direction you want so that the cord heads in the correct direction? This cord just flips / rotates and you have the opposite orientation of the plug's blades. If this doesn't make sense, you should buy one just to show off to your friends. As if this feature isn't enough to pop your cork, it is 14 gauge and shielded to prevent EMI / RFI penetration! 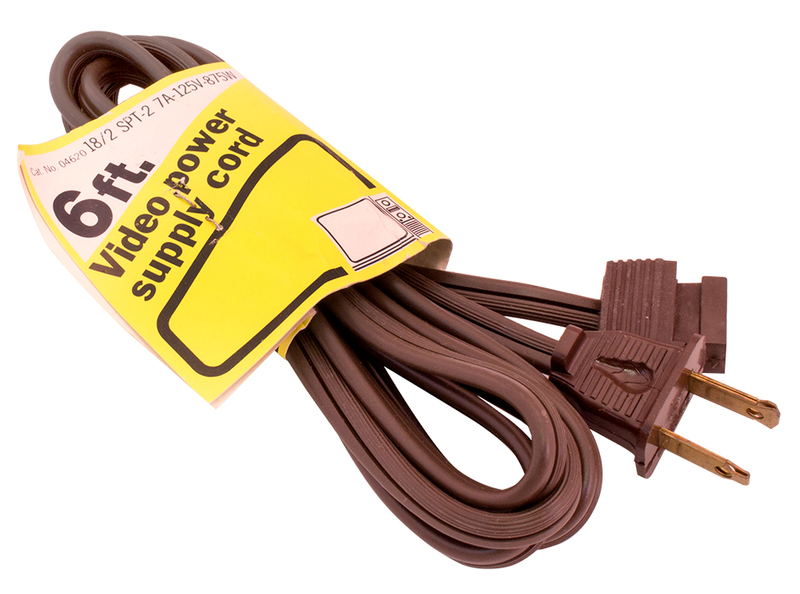 Columbia Electronic Cables video power supply cord. 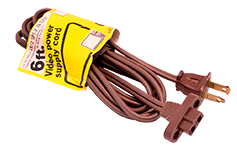 18/2, SPT-2, 7 amp, 125v, brown, 6 foot. UL listed. Polarized with pins. No. 04613. 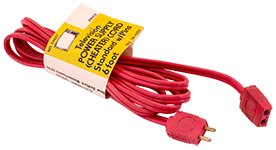 Columbia 6 foot power supply red cheater extension cord. Standard with pins. 18/2. 7 amp. 0.300" centers. U.S. made. 6 foot gray power supply appliance cord. 13 amp, 125v. 16/3, SPT-3. UL listed. U.S. made. Columbia Electronic Cables television power supply "cheater" cord. 18/2, 7 amp, 125v, 6 foot. Polarized male end, polarized mis-aligned female end. 7.2mm center to center, 2 prong holes, 1 @ 2.5mm, 1 @ 3.5mm. No. 24610. Columbia Electronic Cables television power supply "cheater" cord. 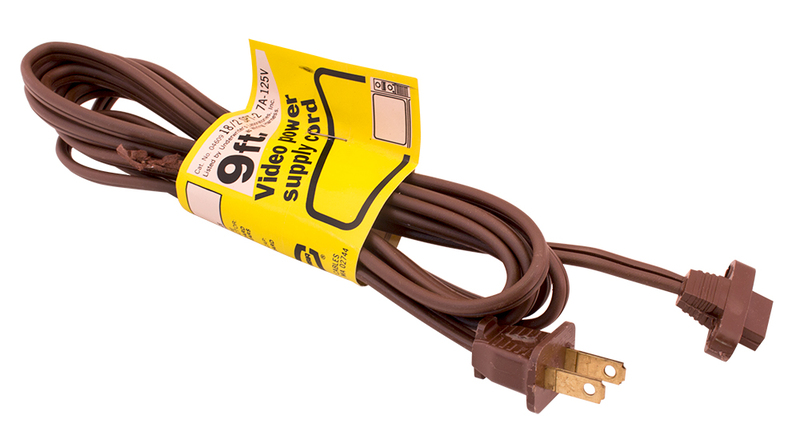 18/2, 7 amp, 125v, 6 foot, brown. Standard male end with pins, female end standard with ears. 7.2mm center to center, 3.2mm prong holes. No. 24612. Columbia Electronic Cables television power supply "cheater" cord. 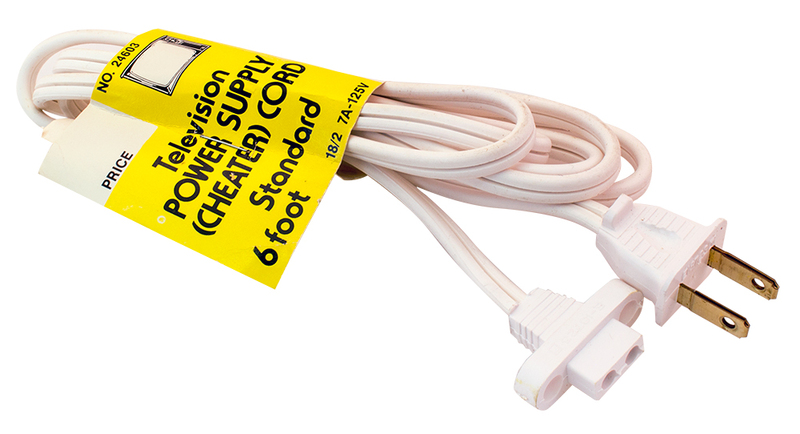 18/2, 7 amp, 125v, 6 foot, white. Standard male end, standard female end with ears. 2.23mm prong holes, 7.42mm center to center. No. 24603. 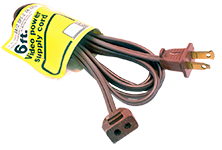 Columbia Electronic Cables power supply cord. 18/2, 7 amp, 125v, 6 foot, white. Standard male end, open other end, copper. No. 24596. 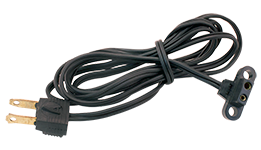 HP Oval AC power cord. 8 foot long. 18/3 SJT. 10 amp, 125v. Includes 15 amp, 125v Hubbel plug. 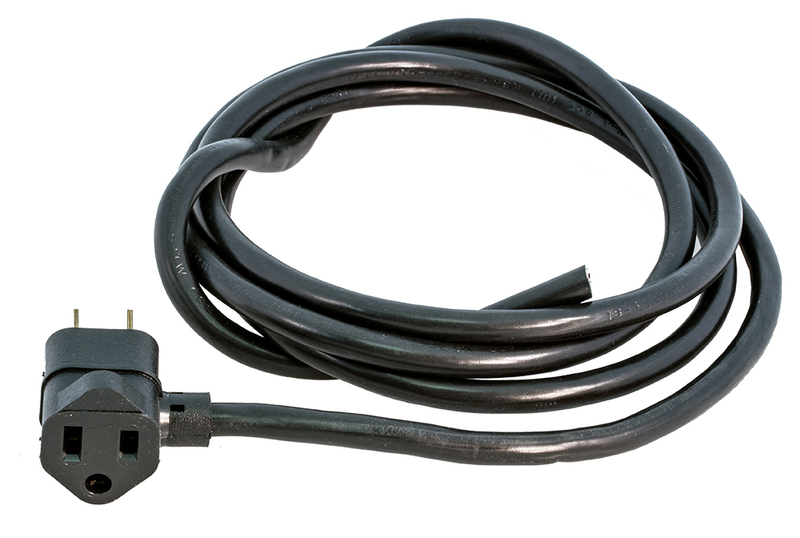 HP Oval AC power cord. 6 foot long. 18/3. 10 amp, 125v. Standard AC plug. 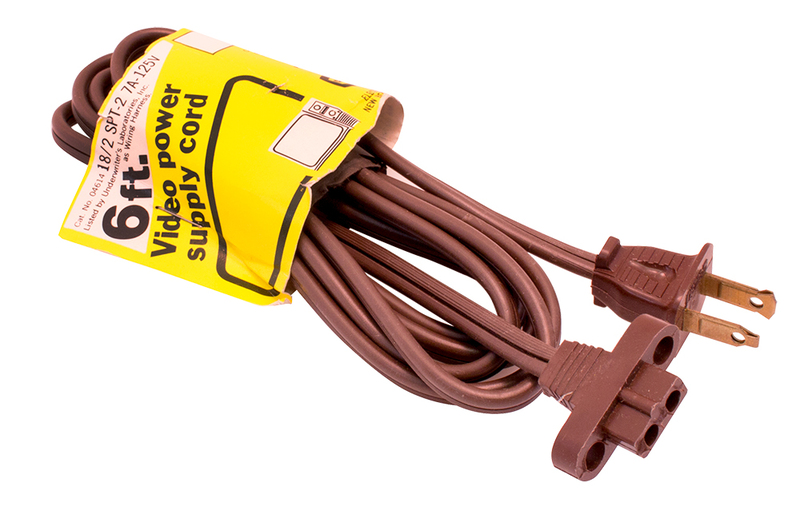 Columbia Electronic Cables video power supply cord. 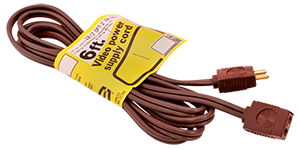 18/2, SPT-2, 7 amp, 125v, brown, 6 foot. Polarized male end, polarized mis-alignment female end. 7.2mm center to center, 3.5mm and 2.5mm prong holes. No. 04621. 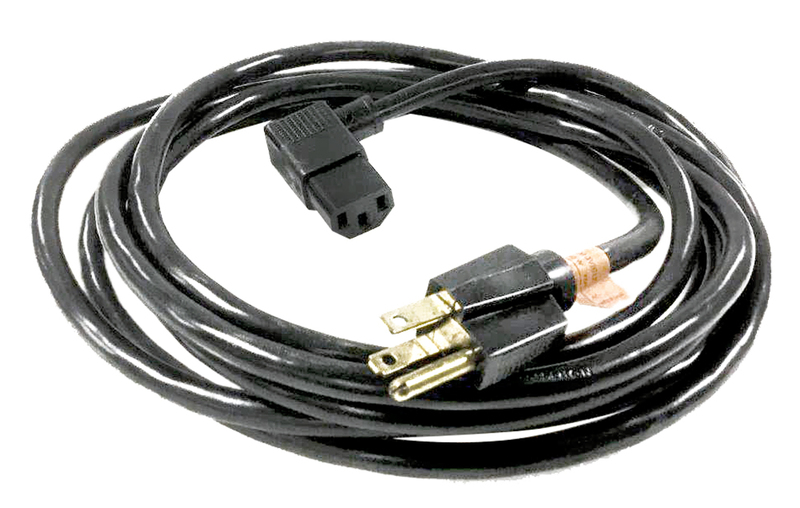 Columbia Electronic Cables video power supply cord. 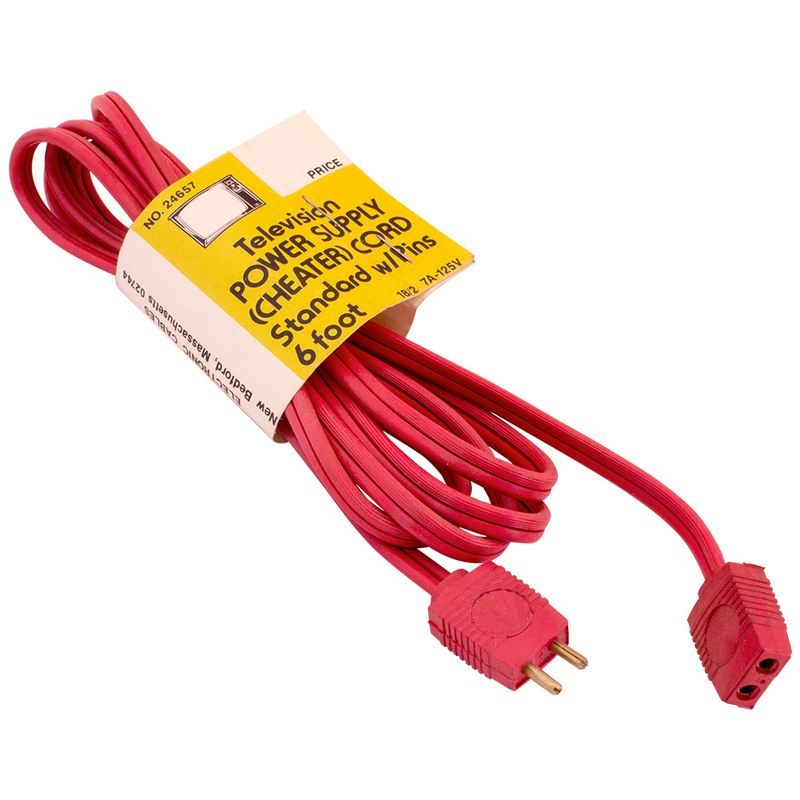 18/2, SPT-2, 7 amp, 125v, brown, 6 foot. Polarized male end, female end polarized with ears. 7.2mm center to center, 3.5mm and 2.5mm prong holes. No. 04614. Columbia Electronic Cables video power supply cord. 18/2, SPT-2, 7 amp, 125v, 875 watts, brown, 6 foot. Polarized male end, polarized c-clip female end. 7.2mm center to center, 2 prong holes, 1 @ 2.5mm, 1 @ 3.5mm diameter. No. 04620. 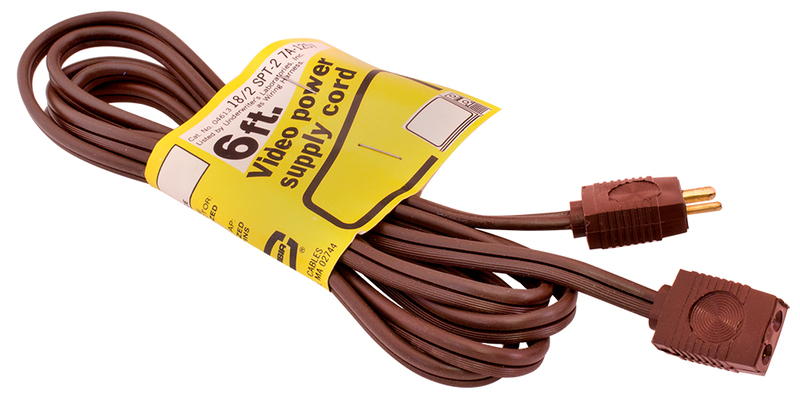 Columbia Electronic Cables video power supply cord. 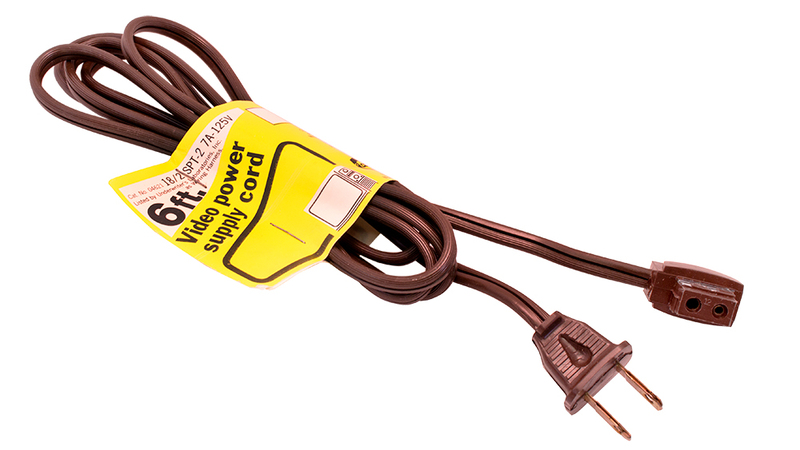 18/2, SPT-2, 7 amp, 125v, brown, 6 foot. Polarized male end, polarized snap-in female end. 7.2mm center to center, 3.5mm and 2.5mm prong holes. No. 04656. 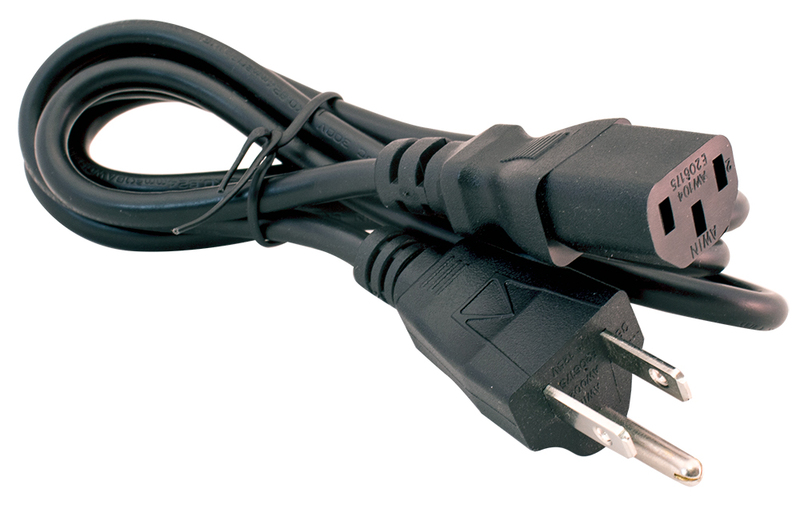 Columbia Electronic Cables video power supply cord. 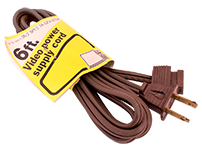 18/2, SPT-2, 7 amp, 125v, brown, 9 foot. Standard male end, standard female end with ears. 2.5mm diameter prong holes. 7.2mm center to center. No. 04609. Columbia Electronic Cables special power supply "cheater" cord. 18/2, 7 amp, 125v, 6 foot, black. Fits Panasonic, Craig. Standard male end, female end accepts 2 prongs. Approximately 1/16" diameter (not C1). 5.4mm center to center. No. 20159. 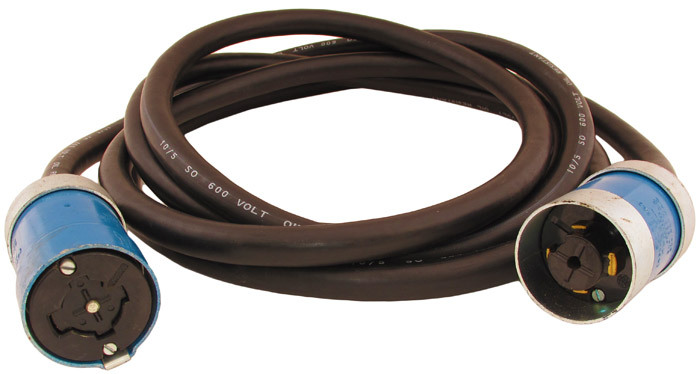 Columbia Electronic Cables "cheater" cord. 18/2, 7 amp, 125v, 6 foot, black. Polarized male end, 2 prong holes on female end. 1 @ 2.5mm, the other @ 3.5mm diameter. 7.4mm center to center. 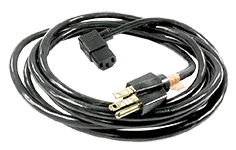 Kawasaki 8 foot AC cord. 18 AWG. Black non-polarized plug. Circa mid 1970's. Japan. Panel Components remote line cord. 3 conductor IEC male - business machine cord. Highest quality. 31" long. Lug terminated pigtail. Bulkhead bushing, mounts in 3/4" hole. 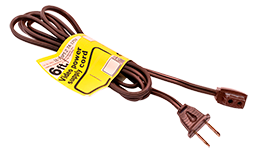 Belden UL/ CSA rated SJT cord. 18/3, molded plug. Collins gray. 10 amp. 10 feet long. 0.33" diameter. 10 foot equipment cord. AC to PH-386 (IEC). SJT jacket. 14 gauge conductors. 14 - 3. Three blade female. CSA & UL listed. Cinch AC jack. 7 amp, 120v. UL listed. Purchased for use on Weathers line of the 1960s. Mates with 2 pin cheater cord (right). 1-1/4" c-c mount holes. 5/16" c-c terminals. 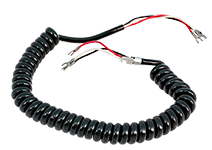 NOTE: Works with all non-polarized Columbia Electronic cables, including (WCC) CHEATCORD. Socket end 2 round pins, same size, non polarized. AC cord 2 blade, non-polarized. UL Listed. 16 gauge rated at 7 amps. 8' long. Brown. Excess new / unused stock from Weathers Turntable manufacturing of the mid 60’s. 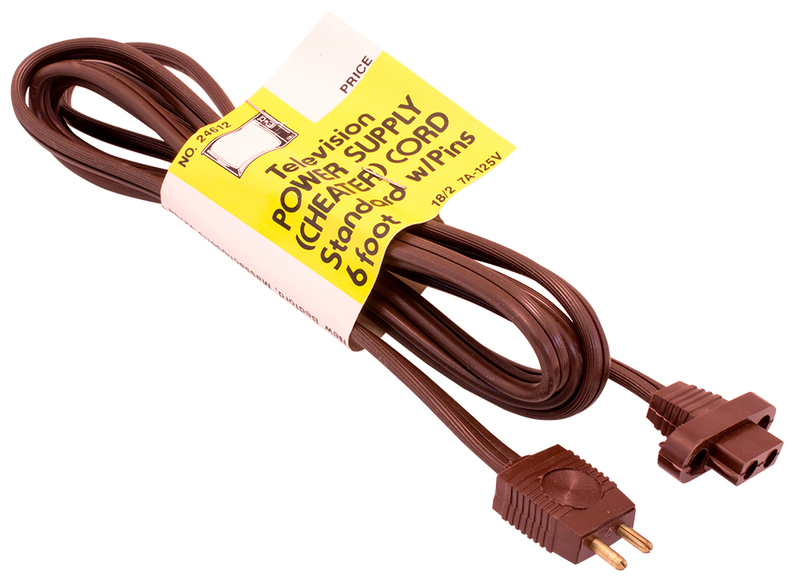 Old fashioned, non-polarized 5 foot brown AC cord. 2 x 18 gauge. 6 foot line cord. 18 AWG. VW-1, SPT-1. 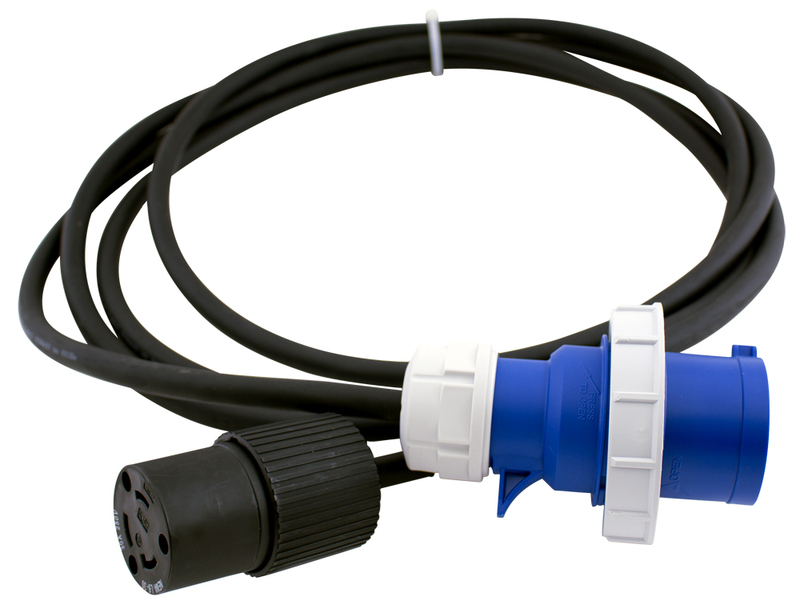 Unpolarized AC plug. Molded 'SF' on plug. CSA listed. Volex Pencon 8 foot power cord with heavy duty three blade plug. Fused with 13 amp fuse. 220v. 220v round pin plug common in Europe. 2mm spacing. 3 blade PH-386 detatchable power cord plug on opposite. 8 feet long. 6 foot cord assembly. 2 conductor. Slate grey woven cotton jacket. NSN: 5995-00-993-2533. 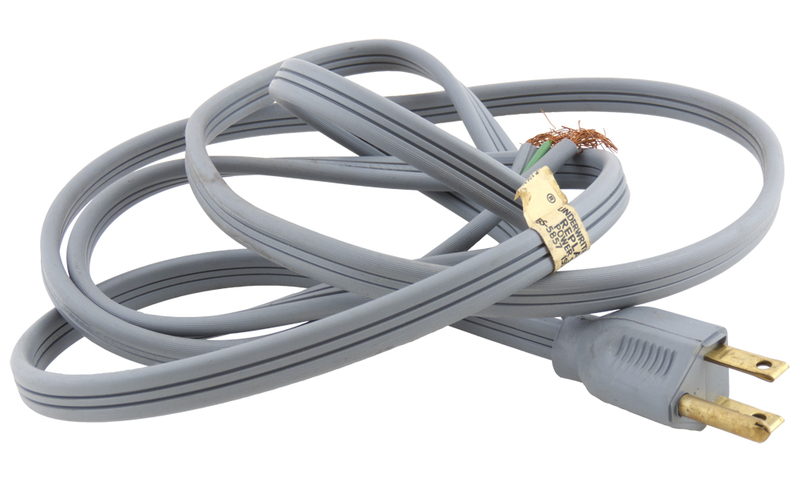 Belden gray 220v cord. 8 foot. 18 gauge x 3. 15.5 foot long, white, 18/3 lamp cord. 3 ground ring terminal. Terminations: Hot wire - large male spade. Neutral - small female spade. SJT 186", 105 white. 105ºC. CSA - UL Listed. 5 foot long, 18-2. 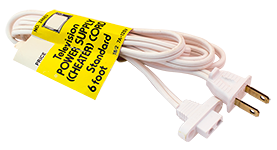 Belden AC appliance cord, 2 conductor white, 7 amp, 300 vac rating. Wires stripped back for soldering. Joy 2 conductor rubber plug with round brass threaded locking nut. 1.7"DIA x 2.9"L; 10 ft 12 gauge. Reinforced, rubber coated and shielded cable. 1/2"DIA. Alt P/N's: HX-8559-B, X-8559, X-8559-9, X-8559-6. 14 ft power cable, 10/5 SO 600v. Oil resistant cord with Hubbell 25415 male armored locking plug on one end, and Hubbell 25414 female armored locking plug on the other. Used, in good condition.